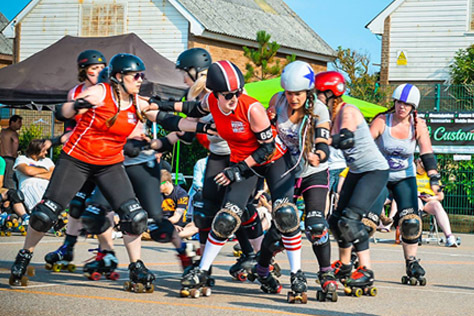 Tomorrow (Saturday 16th August) sees the Bombshells back in Heartland Series action as they travel up to Hemel Hempstead to take on the Norfolk Brawds. It’s Game Day 5 of the South East division and the Eastbourne side’s game is the first one up, with doors at 1pm for a 1.30pm start. 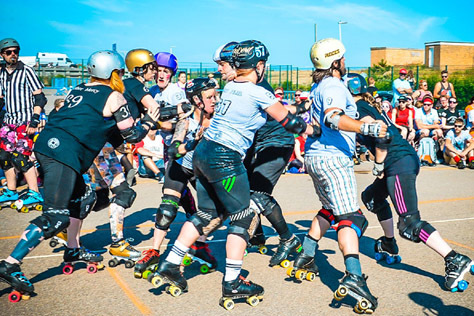 It’s followed at 3.45 by hosts Hell’s Belles against Bedfordshire Rollergirls. Online sales have now closed, but tickets are £10 on the door, £5 for those aged 11-17 and free for younger children. The venue is called Sportspace, and is located a little to the West of the Plough ‘magic’ roundabout, which is officially the second worst roundabout in the UK (after a similar one in Swindon). Travel-wise, the AA route planner estimates around two hours driving time from Sussex for a journey of 80-100 miles, depending on where you’re starting from. There is plenty of parking at the leisure centre, but you’ll need to remember to enter your car registration number into a screen by the building’s entrance to avoid getting a ticket. For those travelling by train, it’s a bit of a hike to Hemel – from Brighton, for example, takes three hours and involves three changes, including a replacement bus from Watford. We’d suggest travelling to St Albans instead. This is not only much quicker (eg 90 minutes and no changes from Brighton) but is also about a tenner cheaper. The towns are only five miles apart, so use some of the money you saved on a local bus to Hemel. It’s also worth pointing out that St Albans is home to CAMRA and therefore one of the best towns in the UK for real ale pubs – just saying, yeah. Flattrackstats currently place the Bombshells 226th in Europe (494.7 ranking points) with the Brawds 279th (475.2). There’s no way to specify a neutral venue on their online predictor, so we’ll split the difference between home and away predictions. 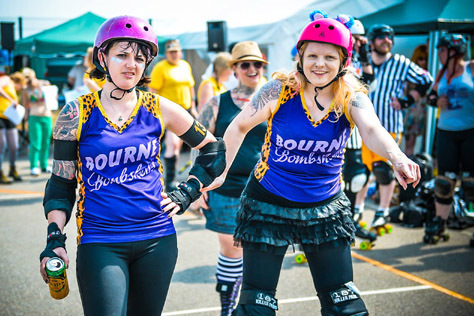 This gives the Sussex side a 67% chance of taking the win, with a score differential of 12:10, which would equate to something like a 180-150 win for the Bombshells. This prediction obviously doesn’t make allowances for the fact that Eastbourne have lost a couple of senior players and their bench team recently, which may make for an even closer game. Derby Data Europe actually call this as a two point game! 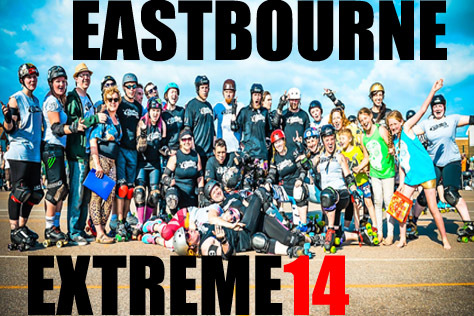 With the Bombshells 160th and Brawds 162nd in their table, DDE’s computer says Eastbourne will win the game 152-150. Blimey! 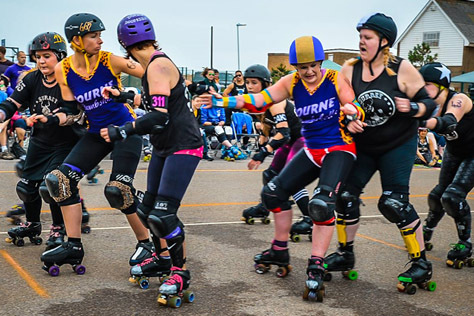 With the Bombshells currently above Norfolk on points scored, a Sussex victory would see them cement their third place in the divisional table, whereas a loss would not be disastrous – Bourne have a game more than Norfolk left to play. In the day’s other game, FTS rank the Hell’s Belles 193rd (504.8 points) and Bedfordshire 329th (449.3). They give the Hertfordshire league a whopping 92% chance of taking the win, and predict a score differential of 35:18, which would result in a typical derby scoreline of around 210-108 to the Belles. Derby Data Europe calls it even more strongly in favour of the home side, predicting that the 111th placed Belles will beat 207th placed Beds 300-96. These two sides currently prop up the divisional table, with both yet to take their first win. The Belles have a superior points difference to all three of the other teams at this event, however, and a Herts victory would see them leapfrog the loser of the opening game to take fourth place. 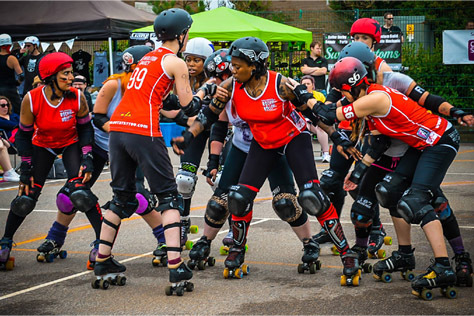 Dolly Spartan was actually the highest scoring jammer in the entire division after Game Day 3 (when Heartland compiled the stats), so Beds will need to keep an eye on her in particular. Hi. 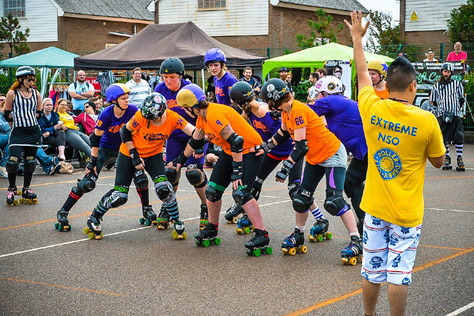 Firstly, how did last month’s Eastbourne Extreme derby tournament go? The weekend went very smoothly, and thankfully the weather held out! I think the highlight was Sunday’s co ed game – the standard was very high and it was really enjoyable to watch. In terms of our own performance, we would’ve liked to have done better against Croydon and LRR. You’re up against the Norfolk Brawds in Hemel Hempstead this weekend. Do you know much about the East Anglian side? I’ve actually played with the Brawds before as part of The Eastern Blocks. They’re a lovely bunch and I think it’ll be quite a close bout. Philthy Delphia and Colletteral Damage are both great players and we’ll need some very strong walls when they’re jamming. This is something of a transitional time for the Bombshells, with the likes of Swann and Chunder Woman having transferred away, and the bench team also departing. How are you adapting those changes? We haven’t actually got a new bench coach yet, so Max Rees from LRG has kindly agreed to bench us this Saturday, which is a huge relief. Our new line up manager (Aladdin Sane) is doing really well and is getting used to the role. Swann and Chunder Woman were two of our strongest players in terms of both jamming and blocking, so we are feeling the loss. Our new players are working really hard and are progressing well, so hopefully the loss of two key players won’t have too big an impact. 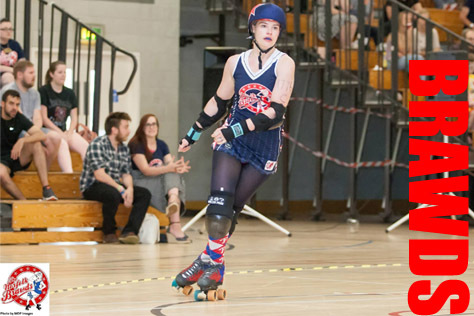 Are there any particular Bombshells players or tactics people should look out for at the game? Would you like to predict the result? I think it will be a very close game. According to Flattrackstats the Bombshells should win. I’m not sure how much the loss of Sassy McAwesome, All Seeing Ivy, Chunder Woman and Swann will affect that – hopefully not too much! Our new captain is Bullet Bomber and she’s definitely one to watch out for. She’s a great jammer. You’re currently third in the South East divisional table, above opponents Norfolk on points difference. Is finishing the season in that position your target now? Yes, we really are aiming for third. That would be a huge achievement for us in our first year of the tournament. I don’t think any of us expected that we would do this well. We are playing Big Bucks in September, and we know that is going to be a really tough game, but having already played Milton Keynes we learned a lot about playing teams that are better than us. We need to try and minimise the points differential in that game – it’s not all about winning and losing for Heartland rankings. Finally, do you have a message for any Bombshells fans in the crowd at Hemel? Our message to Bombshells fans is just to cheer lots, and also sorry, but we don’t have any fire in our skate out this time! Hi there. 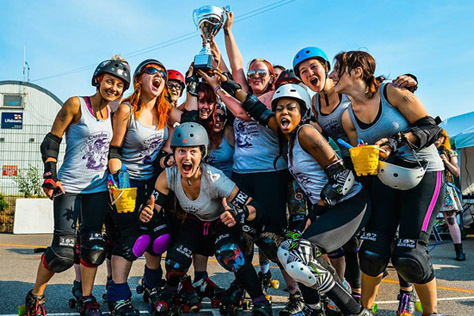 Firstly, for anyone who doesn’t know the Brawds, can you tell us a little about the history and achievements of your league? The Brawds started in a tiny church hall in March of 2010. 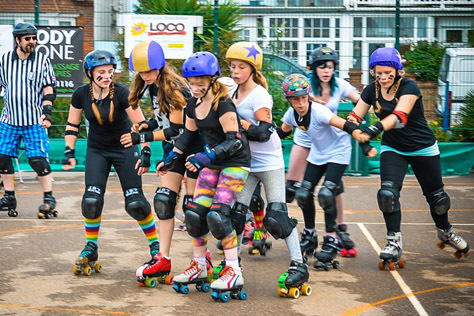 Since then we have grown to a league of over 70 skaters. In 2013 we became a UKRDA member league. In that same year we came third in the East in the Heartland Series and won the inaugural Hotrod Hayride Cup. You currently place fourth in the South East division. How has your Heartland season been so far? Any particular highlights or lowlights? This year has been a tough one for us. We’ve had some really strong new teams in our division as well as some changes in our roster. Both Big Bucks and Milton Keynes really pushed us. However, we benefit from having played together a lot and knowing each other well. 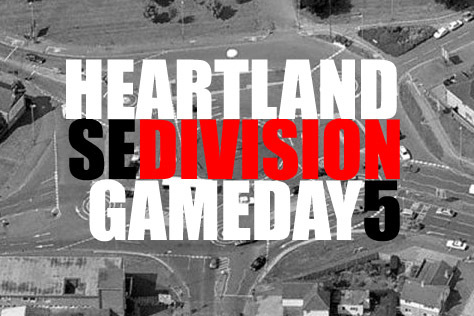 We are determined to win our last two Heartland games. 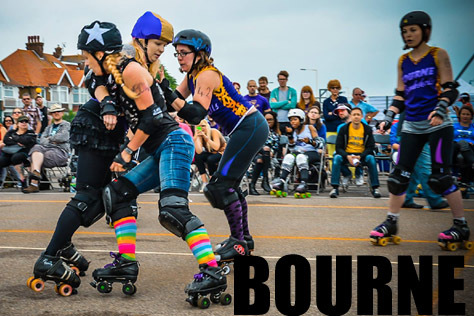 Do you know much about the Bourne Bombshells going into this game? Actually, we know very little about them. In other matches we have tried to work towards what we know about the other team, but it doesn’t always work. This time we’re going into it playing our own game. Any particular Brawds players or tactics people should keep an eye out for? Would you care to predict the result? No way are we going to try and predict a result! That’s a jinx. 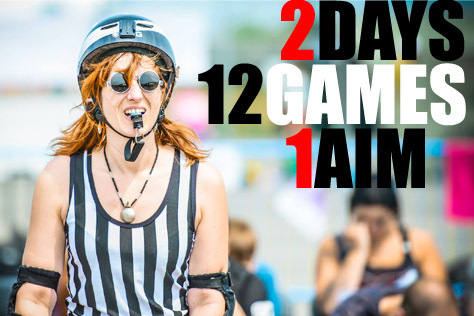 Don’t want to give too much away, but you might see a new face or two on the jam line. 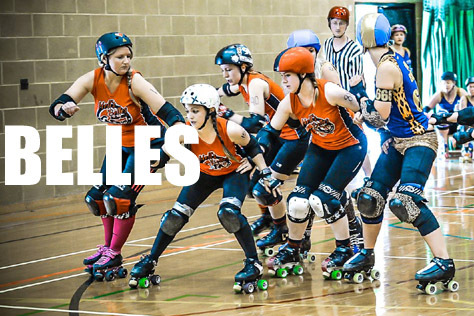 The day’s other match-up sees Bedfordshire take on Hell’s Belles. How do you see that one going? 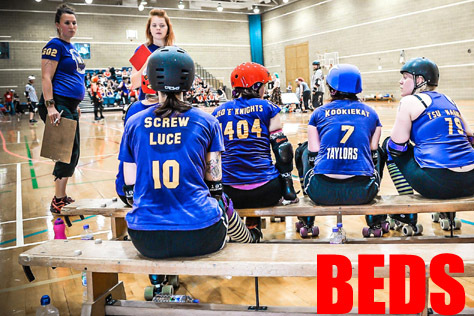 The Belles and Bedfordshire are two of our favourite teams. We played Beds early this season, so I’m not sure how they’ve come along since then, but we know the Belles are fielding a much stronger team than they did last year. They are definitely ones to watch. Finally, do you have a message for any Brawds fans in the crowd at Hemel? Keep cheering for us! It really does mean the world to us and makes all the difference in our game play.